Daily and weekly horoscopes for Western and Chinese zodiac! Updated daily! This free app Love Work Horoscope supports to predict us readings of love, work and finance horoscope. -We can get daily flirt and single/couple horoscope readings here for free. -In special daily readings, we can also get gay/lesbian horoscope here. -Weekly flirt and romantic horoscope and monthly romantic horoscope could give us some advice on love here for free. All these horoscope readings can be a reference in our love lifr. To look for love or keep your love! -Daily career and finance horoscope here can show us readings of our work life here. -also we can get weekly/monthly business horoscope here for reference. -just ask for help from these horoscope readings. Good luck! 3. 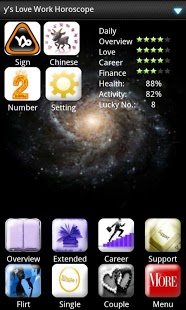 Add horoscope widget on your home screen and you can check your horoscope every day easily. In order to get quick access to your favorite horoscope readings, you can add into bookmarks here. It also supports to share with your friends for free. In this app we can get daily/weekly/monthly horoscopes for work and love life here. General and special horoscope readings could be a help in our daily life. It might be used as a method of divination regarding events relating to the point in time it represents, and it can form the basis of the horoscopic traditions of astrology. No scientific studies could have shown support for the accuracy of horoscopes, and the methods used to make interpretations can be generally considered pseudo-scientific.